When he arrived on the Bowling Green campus, Leon "Bud" Lewis had just finished a record setting senior season at Penfield High School in Penfield, New York, scoring 28 goals on the year and leading his team to a state championship. His impact on the Bowling Green squad was immediate, as the Falcons posted its best record to date (7-2-3), and its first trip to the NCAA Tournament in 1972, Lewis' sophomore year. They would make a return appearances in 1973, and finish with a winning record in all four years Lewis was on the team. In 1974, he was named to the NSCAA All-American team. He was drafted by the Cincinnati Comets of the ASL in 1975, and played one season with the Comets before joining the Buffalo Blazers of the Canadian Soccer League. After his playing career ended, Lewis landed the head coaching job at Wilmington College. After a slow start in his first two seasons, Lewis and the Quakers have recorded 28 consecutive winning seasons, becoming one of the most successful programs in the country. Lewis has over 400 wins to his coaching credit, and in 1986, led Wilmington to the Final Four. He has been named Ohio Coach of the Year three times. 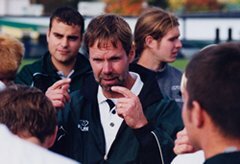 Inducted to the BG Athletic Hall of Fame in 2000, Lewis also serves as the director of Greek Life and Wellness at Wilmington College.